When it comes to projects around the house, many homeowners choose to make it a do-it-yourself (DIY) project. However, there are some tasks that are beyond the capabilities of some, such as the installation of gutters. Gutters play a key role in sustaining your home’s well-being. They keep your roof, foundation, and landscaping intact by directing water away from your premises. However, gutter systems only work properly if they are correctly installed. While installing gutter guards by yourself can save you some cash, not having the proper experience can compromise the gutter system’s quality, even your safety. To yield the best results for your gutters, it’s preferable to hire professionals with a proven reputation and record. Making gutter installation a DIY project will come with some challenges, the least of which is having to go buy and transport the materials yourself. Quality is another issue you will likely encounter. With gutter installation, it is not a matter of whether or not the final product looks good, but whether or not it will be effective. If your gutter system isn’t installed properly and fails, you’ll be the one stuck with paying for extra gutter repair. Instead of doing the job yourself, hiring professionals for the job has the advantage of producing the best results. Professionals will follow a standardized installation process to ensure that every joint is properly sealed and that each bracket is properly distanced. Not to mention, some gutter types are especially difficult to install by yourself. For example, seamless gutters are made from a single piece of stainless steel and require specialized machinery to shape. Installing gutters yourself can take a lot of time out of your days. Not only do you have to remove your current gutters, but you also have to go out and purchase the right materials, transport them back to your home and install them yourself. Delegating the task to an experienced gutter contractor will save you tons of time, as they come prepared with the necessary tools and equipment to get the job complete. Think about it, the time you save from DIY gutter installation can be spent doing other, more enjoyable things. Without the proper skills or experience, doing the installation yourself can run you the risk of slipping, falling, or injuring yourself in some other way. Instead of having to pay for gutter materials and a hospital bill, it is better to rely on the professionals since they possess the proper knowledge and tools to complete the installation safely. Many people believe that hiring a contractor for home projects is pricey and extraneous. When it comes to gutter services, though, hiring professionals for the job can actually help you save money by using quality materials and tried-and-true techniques. Simply put, professionals will ensure that the job is done right the first time. Professionals will leave you with a quality gutter system for years to come, eliminating the need for any near future repairs or replacements. 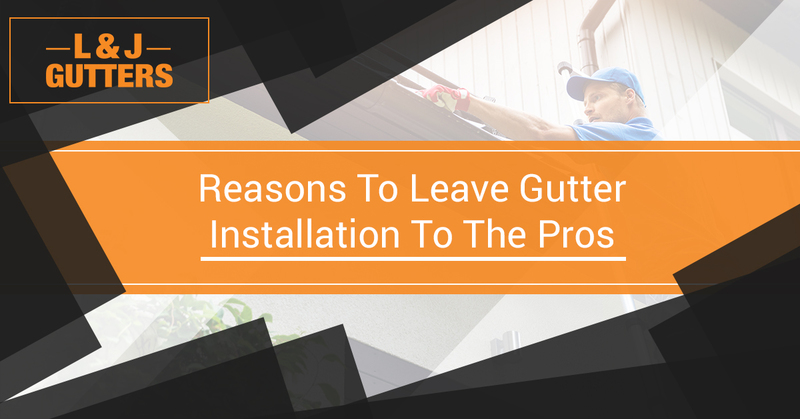 These are just a few of the many reasons why you should leave gutter installation to the professionals. Not only will hiring professional gutter installation companies save you time, money, and from injuring yourself, it will also leave you with a quality and durable gutter system that will last for years to come with the proper cleaning and maintenance. If you need gutter installation in Freeport, Florida, you can rely on the team at L&J Gutters! We bring over a decade of gutter installation experience to the table. This means you get skillful installation and service, from the moment we plan your gutters to the first time you are in need of gutter cleaning services. To learn more about our services or to receive an estimate, contact us!